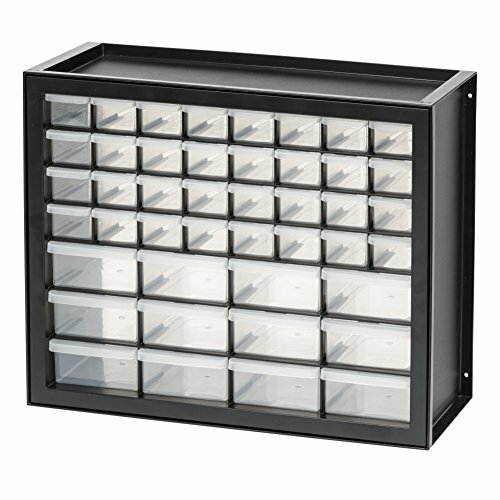 Whether you’ve got nuts and bolts or beads and buttons, the 44 drawer cabinet will help keep you organized. These conveniently sized small and large drawers are great for holding an array of small pieces, and the built in lip at the back means they won’t fall out of the drawered cabinet when opened. Multi-drawer units are optimally designed for stacking or mounting on the wall to maximize storage space. Screw holes on the sides of the 64 drawer storage unit mean you don’t have to put screws in the wall in advance, and ribs on the 4 corners keep the stacked drawered parts cabinet from falling over when moved side-to-side, front-to-back, or when opening drawers. Small inner drawer for multi-drawer stackable cabinet measures 6.00” x 1.75” x 1.50”. Large inner drawer measures 6.00” x 4.00” x 2.00”. Large inner drawer dimensions: 6.00" x 4.00" x 2.00"; small inner drawer dimensions: 6.00" x 1.75" x 1.50"